What's REALLY Keeping You from the Success You Desire? - EVERY TIME - no matter the audience size! *RISK FREE: We promise to never sell, rent, trade, or share your email with any other organization. 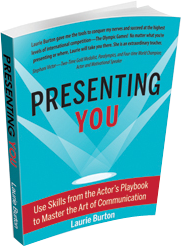 Laurie Burton Training has developed effective, innovative programs for those who speak and present to audiences of any size, that deliver the kind of results professionals crave. Our personalized training focuses on the skillful use of your greatest tool: The Amazing Human Body.